I'm new to the forum. I joined realizing that this is about the only forum where vintage Indian tech talk can be found. I discovered after removing the cylinders on the 1945 engine, recently purchased, that the baffles are partially knocked out. I have researched the issue of removed or broken baffles with mixed results. The majority of information that I saw indicates that you should never remove them as they aid in getting oil to the pistons, especially the front one. I have also read that they keep too much oil from getting to the rear piston. But what are my options since mine are partially gone? Will modern pistons eliminate the need of these baffles? I am at a crossroad concerning whether to move on with this project or to bail out. The latter would be a big disappointment. I really want and need this Indian! Any info that can be provided would be appreciated. Chuck, don't be too concerned about them. I have run a Chief without them for 25,000 miles. Just make sure they are solid, and not likely to break out in the future. If they are cracked or loose, remove them. I'm sure some people will say they have to be there, but I have and will continue to run my Chief without them. Thanks. Are you running the stock Indian pistons? No, running JCC pistons with a modern 3 piece oil ring. Plenty of Chiefs have run std pistons with partial or no baffles before, the baffles tend to get destroyed when engine blow up's happen. I'm sure that's how yours disappeared. Too many riders have done long miles without (effective) baffles to anticipate damage as inevitable. If you have it apart I would remove the remaining bits shown. No baffles has a small advantage: the engine is no longer using power to compress 37" of volume (under the front piston) in & out of the baffle slot. Result is theoretically slightly more power, reduced oil entrainment (foaming), reduced internal air and oil temperatures. Some encouraging info guys. Thanks! 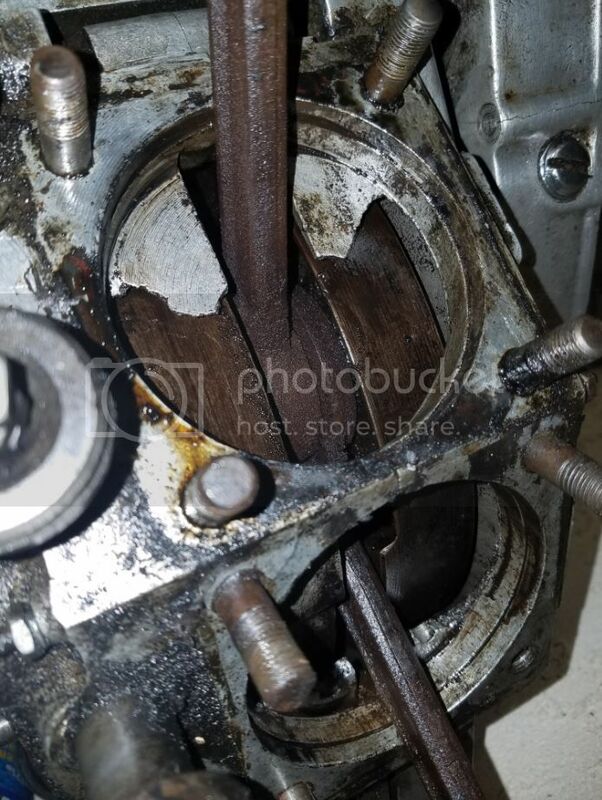 Late 20's JD Engine Baffles? Crankcase baffles & lower end.